3D printing emerged as a prototyping technology in the 1980s, and has been rapidly evolving ever since. The ongoing developments of the last few decades have transformed 3D printing (also called additive manufacturing), into a viable and cost-effective technology throughout the production environment: from prototyping, to production enablement, to direct 3D production. Companies that utilize 3D printing can attain and cement a leadership position in their industry through the time, cost, and capability advancements 3D printing makes possible. 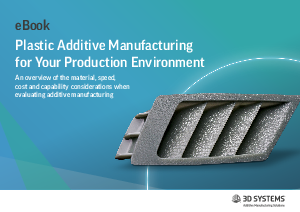 This ebook provides an overview of the 3D printing technology and material advancements in 3D Systems’ plastic additive manufacturing that extend the addressable range of production applications. Download this E-book today to learn more.